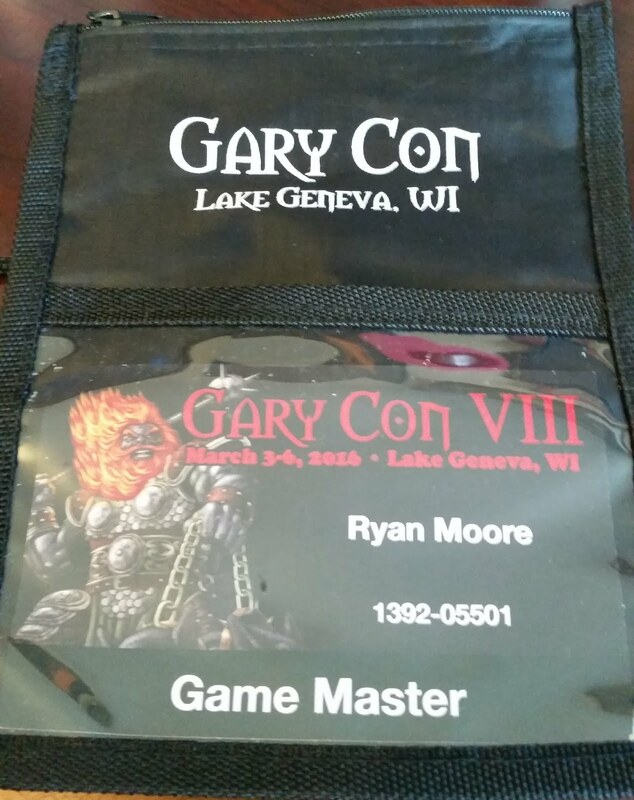 This year I braved the frozen north of Lake Geneva to attend Garycon for the first time. It was a fantastic convention. Each convention I attend inspires me in some way and Garycon was no exception. Thursday afternoon, I played in +David Baity's excellent Krampus DCC funnel. We were all "bad" kids trying to escape our eternal punishment from Krampus's workshops. Alas, my level zeroes did not survive. Thursday night +James MacGeorge roped me into playing the Boris Vallejo game he had picked up in the dealer's room that day. Let's just say it's a much better art piece than a game. On Friday I had scheduled a Warhammer game. I wasn't sure if it was an RPG or a minis game. It turned out to be a homemade Warhammer fantasy board game. It used the basic Warhammer rules and parts and pieces from Warhammer Quest, Heroquest, and Warhammer fantasy battles. 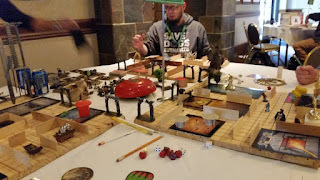 Each player was given a wizard who was randomly teleported into the dungeon of death. The idea was to kill off as many of the other wizards as possible while remaining alive. The GM, who went by the nom de guerre "Smokin Potts," had populated the board with all kinds of random odds and ends. Each one could be interacted with, usually to a deadly effect. My first wizard teleported in on top of the "infernal machine", which killed him instantly. My second wizard touched a statue of an angel. The first time it healed him. Alas, he went in for a second touch and was lifted up to heaven. 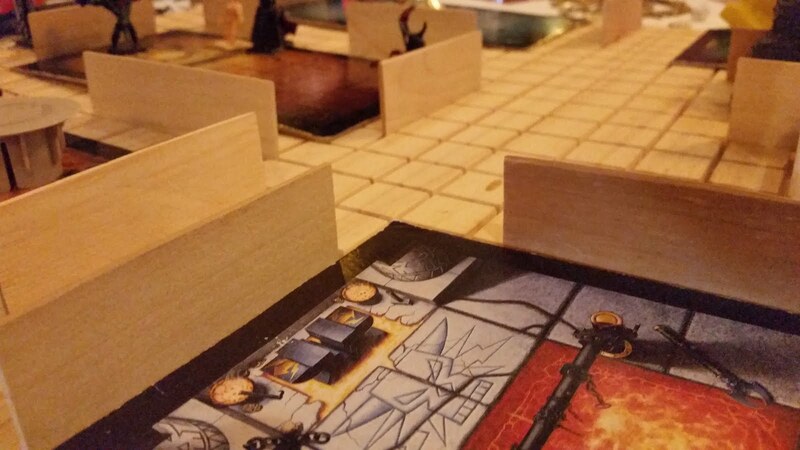 My third wizard ruled the board for a short time, but was finally brought down by the "dance of despair" spell. I realized while playing that I could make a 40k version of this game.Warhammer 40k second edition has all these neat psy power and wargear cards, that can be used. I just happen to have one stashed in my closet too. So yes, my first inspiration from GaryCon is making my own boardgame. Death Hulk! Coming soon to this blog. 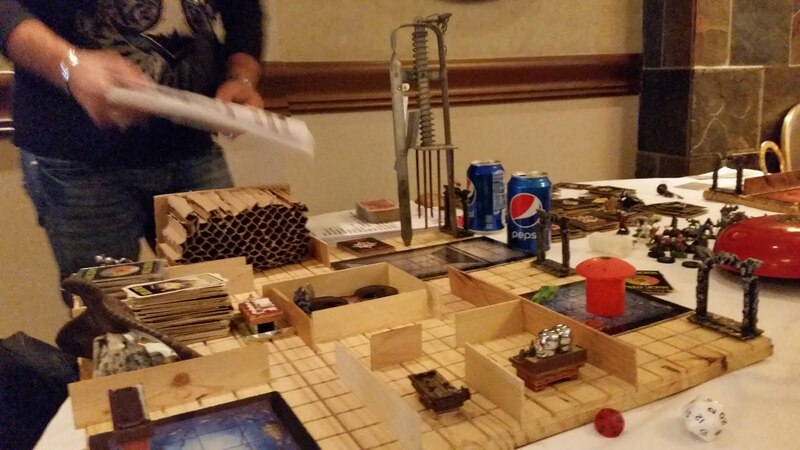 Friday night, +Paul Wolfe ran an excellent game of Black Powder, Black Magic, a weird west game using the DCC rules. I played the Charlatan, who uses tricks and misdirection to make people think he can do magic. I think my next campaign, will be a DCC deadladns game using this and whatever +David Baity is cooking up with Dark Trails. Saturday was all DCC, all day. 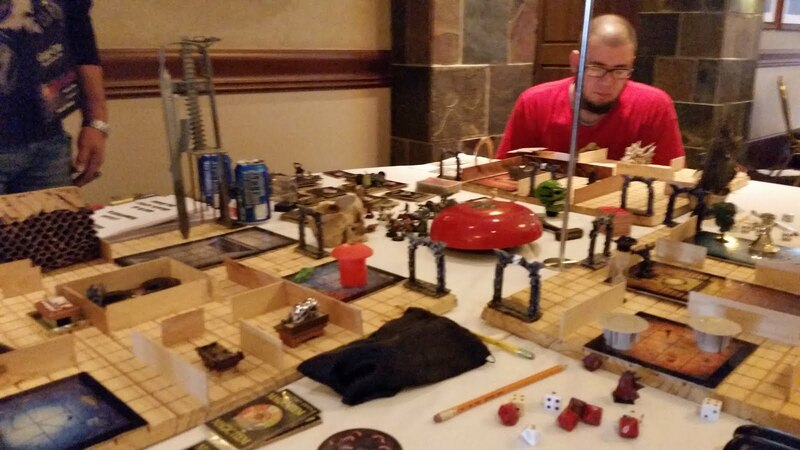 First, I ran my Thundarr DCC game for an excellent group of folks including Mr. "Crawling under a Broken Moon" himself, +Reid San Filippo. 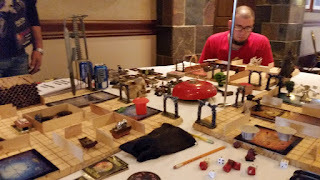 Afterwards, Reid and I changed spots, and I played in his He-Man inspired post apocalypse game. Not wanting to stop the DCC run, I jumped right into +Eric Hoffman and +Jason Hobbs 22 player Black Powder Black Magic game. It was Outlaws vs Townies in the old west. The final showdown had an earth elemental and a toxic gas cloud, as you do, in the weird west. Sunday, bright and early, I showed up to play a game of Morrow Project. I was interested to see how the GM would run it. The Morrow Project system can be complex. The GM (Kris Vezner) had adapted it to the FUDGE rules. I'd never played FUDGE before. All I knew about it was that it used the + - dice like FATE and was somewhat a predecessor of FATE. The game was great! FUDGE works well and is easy to understand. 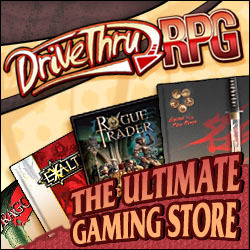 It got me thinking about all my FATE RPGs. I love the games but the FATE system never clicked for me. I could reverse engineer them as FUDGE! Now I had my second inspiration from the con. And there you have it, my first Gary con. Now I'm off to make a board game and some FUDGE campaigns.